Export is a mode in Code Cruiser Configuration Tool (CC Designer) available through main menu BUILD>Export. To be able to use Export mode you should create an account. Export is used at final stage of application configuration in CC Designer. As a result you will get an application as a source or as a URL (deployed on Code Cruiser cloud). Preview - if you select this option all other options (except Export Windows Client) would be ignored and application will be deployed on Code Cruiser cloud for 3 hours. No custom code allowed in this mode. At the end of the export process you will see preview URL (as a log message). If you miss an URL you could retrieve it at https://cloud.code-cruiser.com/app/MyPreviewsScreen. Export Windows Client - if checked native windows client would be exported (source code or binaries). Export Web Client - if checked web client based on AngularJS would be exported. Export Windows Hybrid Client - If this option selected Export Web Client option would be mandatory (see Build & Run chapter for details on how to build this client or learn more about hybrid clients). Export Linux Hybrid Client - If this option selected Export Web Client option would be mandatory (see Build & Run chapter for details on how to build this client or learn more about hybrid clients). 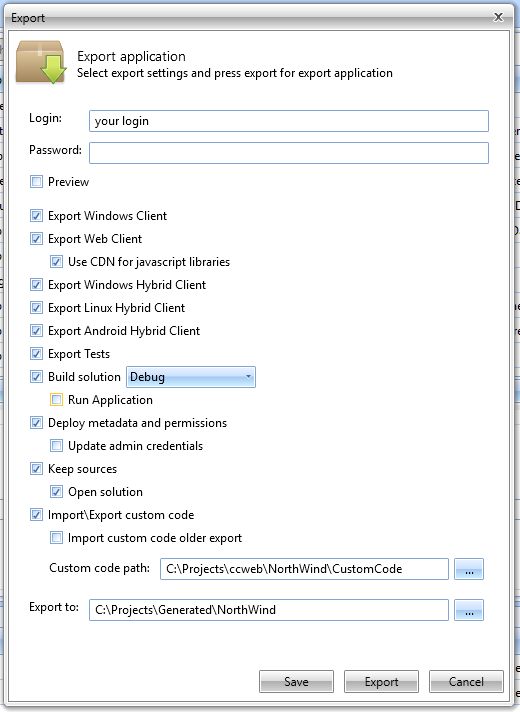 Export Android Client - If this option selected Export Web Client option would be mandatory (see Build & Run chapter for details on how to build this client or learn more about hybrid clients). Export Tests - if checked will include server CRUD tests into exported solution (see CRUD Tests chapter for details). Build Solution - if checked binaries would be provided (in \Build folder). This option is very useful if you have troubles with setting up your development environment but want to see your application running. Take into account that this mode significantly increases export time since there are large files to download (see Build & Run chapter for details on how to run your application). Deploy Metadata And Permissions - if checked metadata script would be executed using default connection to database (see Deployment chapter for details). Update Admin Credentials - if checked credentials update script would be executed using default connection to database. Script would update login and password (login, password and salt could be changed at Project properties) for user with Id=1. Keep Sources - if checked source code will be provided. Open Solution - if checked opens visual studio with exported solution. Use Custom Code - if export process should use custom code (see Code Behind chapter for details on custom code). Custom Code Path - is a path to folder with custom code (see Code Behind chapter for details on custom code). This option is mandatory if you select Use Custom Code option. Export to - is a folder where the results of the export would be placed. If export is in preview mode then logs would be placed in the folder. Notice that folder would be cleaned before export. If you have any unsaved content it would be lost. We recommend to export to the new folder each time to avoid possible data loss (incrementing numeric folder postfix for example).